I presenteth to you my very first Twine game (instructions below). First, what is Twine? It's an open-source tool where you can design text based games, but you can also add images and all sorts of stuff, with the right knowledge it can give you a great deal of design versatility. But the beauty of Twine, at least for me, is that it kinda deals with the essence of a digital game, expressing this as far as it can go without exposing the actual code (which would be incomprehensible to most people). Lovely, detailed visuals are great and all but it sort of masks the fact that you are doing not much more than what you would do in a simple Twine game. A more cinematographic approach maybe impresses people more and might feel easier to quickly engage with, but the basics are pretty much the same: you are able to interact with certain elements, these respond to your action with some sort of event; and for many games that offer dialogue choices or silent characters that "talk", text is an essential interactive element. Anyway, there's room for all kinds of designs so why not engage with a not as simple as it seems Twine game? 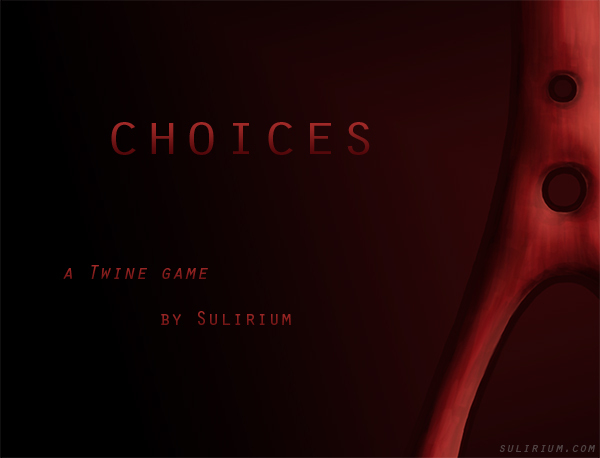 Click on the image below and it will take you to my little game (if you're using a cellphone or small tablet, go with this version: Choices-mobile). It's very short by the way, won't take much of your time. The interface is pretty straightforward but just in case: follow the blue text. The finished product is HTML so it should open properly in any modern browser. Enjoy! You can download Twine from here. There's a bunch of material on the web about it, a good easy tutorial to start with is this one: How to make games with Twine, by Anna Anthropy. She also links to a few games at the end (some links seem broken though).